Silicon Labs recently introduced their SiLabs SiM3L1 ARM Cortex M3 Embedded Processor For Low Power Embedded Systems. This is an ultra-low power family of processors / MCU and an associated suite of “power-aware” development tools. Experts believe the IoT will comprise an estimated 50 billion intelligent devices by 2020, autonomously sensing, monitoring, processing, controlling and communicating over wireless networks. Because many of these intelligent end nodes will be powered by batteries or harvested energy sources, they require exceptionally energy-efficient MCUs such as the SiM3L1xx devices that enable developers to optimize system-level power consumption. One benefit not typically found in other MCUs is the ability to power additional components from the processor. The high efficiency dc-dc convertor internal to the MCU provides enough pass through current to drive most external peripheral found in an IoT devices. This saves both cost and board space by eliminating the need for additional discrete LDOs (low drop out regulators). 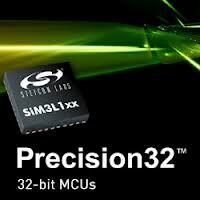 In addition to the hardware features incorporated into the SiM3L1 family, SiLabs also provides a free software development suite, called Precision32. This includes the Eclipse based IDE, compiler and debugger. For low power embedded system design, this tool suite also has a GUI for configuration of all registers, clocks and peripherals with guidance tips for firmware configuration. There is also a visual power estimator which clearly shows how much and where power will be consumed in the realized system. There is also a full set of code examples and software applications that can be used royalty free. These include examples that achieve critical data sheet specifications. The SiLabs SiM3L1 ARM Cortex M3 Embedded Processor is available now in the sub $5 price for large volumes. For more information, data sheets and software downloads, please visit the SiLabs MCU home page.